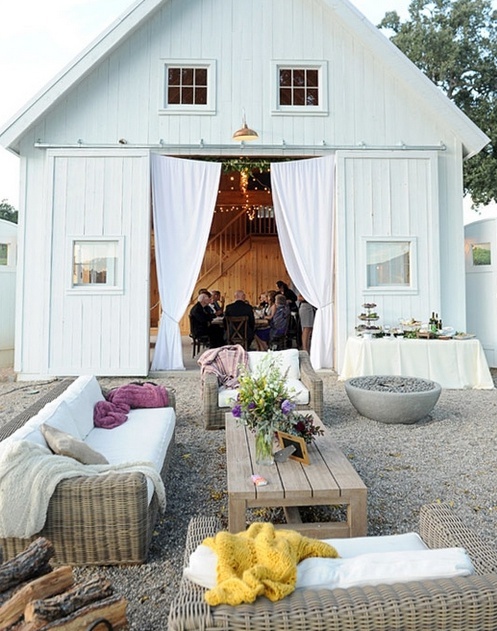 While scoping out an inspiring image for my latest installment of room to outfit I came across this image of a barn soiree that took my breath away. Most people would file it under wedding's and events but I immediately took a mental photograph and put into my house loves. I adore barns, ever since moving to New England and deciding this is where my husband and I would call home, I knew I wanted a barn on a future property. If/when John and I ever venture to the burbs, this is exactly what I imagine our barn would look like. He will likely agree on the exterior appearance but what we do with the inside will be a whole other story. He dreams of his very own lab space where he can continue on with his complicated projects of solving the wireless worlds communication issues (thank you in advance for this honey). I however would likely have the barn adorned with a killer kitchen, guest bedroom, entertaining space & outdoor living room just like my beloved Ina Garten (seriously look at this link, you will be wide eyed like a kid in a candy store like moi). It would be detached from the main house and be a retreat for our guests and family to stay when they came to visit - a girl can dream! Ahhhh - for the love of all things pretty can you even stand how exquisite everything is displayed in the image below, beautiful crisp summer evening, family around a big table, lounge area for after dinner drinks & a happy occasion to celebrate with people you love. The clean white exterior with the large sliding doors and perfectly draped curtains have me squealing with glee. If I could day dream up an ensemble that was comfortable yet chic the below about sums it up. I can easily drift off into a wonderful evening with my friends & family, drinking good wine & laughing about our glory days snuggled up in those comfy chenille throws. p.s. I know that Lanvin sweater is ridiculously over priced but I couldn't resist its gorgeousness, here is a more affordable version with a separate flower pin here. I love the your idea of turning a barn into a guest house and/or entertaining area! I love a good barn as well!